Start capacitors are used to give the the air conditioning motor a boost of electricity to help with the starting cycle. When a start capacitor will fails, the fan motor will simply hum as power is sent to it. The motor will eventually trip an overload protection circuit built into the system and then no power will be sent to the motor and the start capacitor will have to be replaced. The start capacitor is usually round and cylindrical with a number of prongs on top. The run capacitor will be an oblong shape. I opened up my a/c unit and located the start capacitor. It was immediately obvious that it had gone bad. I wasn't too pleased with this as I had the exact same problem last Summer and was charged $100 for a replacement. 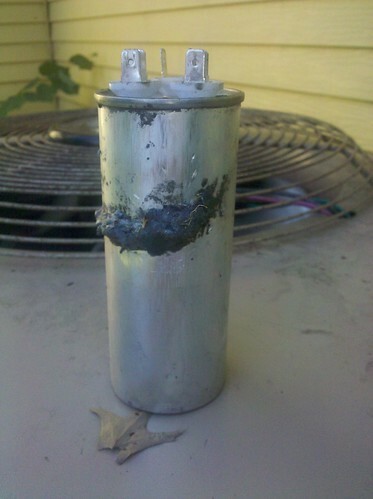 A capacitor can fail for a number of reasons and can be indicative of a larger problem with the air conditioner. Whatever the reason why this particular capacitor failed, I resolved to fix it myself and avoid being charged two arms, two legs and my first born for the service. The failed capacitor has a lot grime on it, but I was still able to read the part number and order a replacement via a heating/cooling supply store for only $15 including shipping. When it came time to actually replace the start capacitor, I made sure to shut all the power off to the unit via the circuit breaker. I was careful to document exactly how all the wires were attached to the old capacitor so I could replace it properly. After that, it was just a matter of connecting the wires to the new capacitor, closing up the access panel on the unit and restoring power to it. It took about 10 minutes for the fan to kick on, but once it did, I screamed like a giddy school girl at a Justin Bieber concert. I had replaced my air conditioner capacitor without electrocuting myself and without suffering any collateral damage in the form of lacerations on my hands. Don't you feel super-human? Slightly euphoric? I love it when I can fix things... I feel- competent. That's the word. Words cannot describe how I felt, but if I had to boil it down, I'd say I feel invincible. Success feels so empowering. Awesome, great job! Bet that felt cool to fix..literally! I know this is old but I have to say well done. it's hard to find someone capable with their hands like that. Usually you have to hire someone. I just literally finished explaining to someone the importance of a job on your home done the right way - it's like an investment!! You can read if you want, rhodeislandqualityhvac.blogspot.com but, the bottom line is that you do not want to do something you're not comfortable with - seems you were completely comfortable with this though, so more power to you! I've got a lot of respect for someone who does it right themselves!